The Orc homeland of Orsinium has had a troubled history. 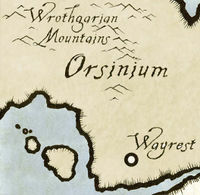 Indeed, for most of the past two thousand years Orsinium has existed only in the dreams of the Orc people. The current land, sometimes called Nova Orsinium, is the second incarnation of an Orc homeland in the Wrothgarian Mountains of High Rock. The first was a creation of the tenth century of the Second Era [sic], a refuge for Orcs harried from High Rock, Cyrodiil, and Skyrim by the expansions of the Empires of the men and mer. High in the mountains, far from their enemies, the Orc chieftain Torug gro-Igron brought his people together. A few huts grew into more permanent structures as word spread to the far-flung Orcs of Tamriel that there was a civilization on the rise that would welcome them from their wanderings. If the Myth of Mauloch is to be believed, the Orcs or Orsimer had been pariah of the land for two hundred years, and if it is not true, their destitution was even longer. The dream of Orsinium was too beautiful not to be sought. It is impossible to achieve an objective look at the reality of the first Orsinium. The chronicles of the time paint a picture of a fortress ruled by savage law, leading raids on its neighbors along the Bjoulsae River. According to Orc historians, though, it was a utopia, a peaceable land of agriculture and commerce. The truth is likely somewhere in between, but all written and archeological evidence was destroyed in the Siege of Orsinium. For thirty years, a joint military force from Daggerfall, Sentinel, and the Ansei Order of Diagna attempted to breach the seemingly impenetrable walls of Torug gro-Igron's fortress kingdom. In 1E 980, they succeeded, annihilating all who lived within, scattering the stones into dust. The Orsimer exodus was long and particularly deleterious to the character of its people. They had never been well-regarded by the other inhabitants of Tamriel, but now, with no hope, they became little more than monsters. Other Orcs with vision attempted to create homelands over the next three thousand years, but all were attacked and destroyed before they could take root. In 3E 399, however, a new Orc visionary, Gortwog gro-Nagorm acquired the land near the former site of Orsinium, and began to construct a new city for his people. Graced by statues of Orc heroes such as Mauloch and Torug, and built of iron, Nova Orsinium seemed destined to provoke the same reaction by its neighbors as its predecessor did. Gortwog, however, proved a diplomatic as well as a political genius, and his land has prospered. Following the events of the Miracle of Peace, it now encompasses a substantial territory of central High Rock, and its application for elevation to Provincial status is under review by the Imperial authorities. Its recent alliance with its former foe in Wayrest shows promise for a stable future. The only troubling sign for Orsinium is a religious conflict that has brewed over the last ten years. Traditionally, the Orcs have worshiped the Daedra Malacath (Mauloch) as their patron deity. Gortwog, however, has established a new priesthood devoted to the worship of Trinimac, the ancient hero of the Orcs, who legend has it was devoured by Boethia and became the Daedra Malacath. The Orc King's belief that Trinimac still lives and that Malacath is a separate entity, a demon whose aim was to keep the Orsimer pariah folk forever, is the official position of the shaman priests of Orsinium. A minority of traditionalists within the territory, and the majority of Orcs without, view this as heresy. There is fear even among those who support Gortwog and Orsinium that turning their back on the Daedric Prince of the Bloody Oath is a dangerous policy indeed. This page was last modified on 17 November 2018, at 00:05.